Since 2010, Airpocalypse in China killed 1.2 million people. This was according to the new study reported by The Examiner. Airpocalypse was also known as Air pollution. 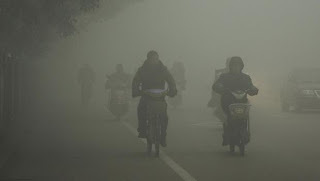 According to source, "China’s toll from pollution was the loss of 25 million healthy years of life from the population." The air pollution in China was so bad according to the environment expert. All people their need to wear mask while walking. According to CNN, "people in China believe that air pollution not only needs to be addressed, but that’s it’s a problem that has gotten out of control." For the meantime, If you like this news, please bookmark it now or visit this site more often for you to be updated. You may also share this post to your friends so they may know about the Airpocalypse in China. Comments or suggestions about "Airpocalypse in China killed 1.2 million people" is important to us, you may share it by using the comment box below.